The math is simple: three guitarists; 10 tracks; and five vocalists, each exploring two love songs, one vintage and one more contemporary. 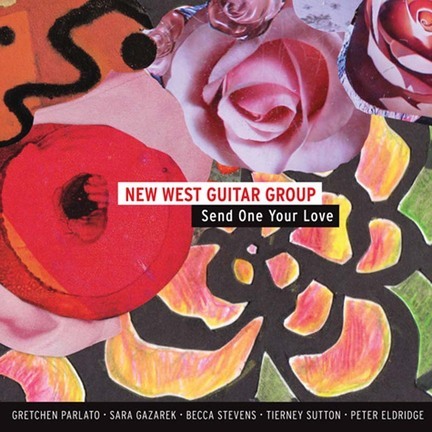 The three players-Perry Smith, Jeff Stein and John Storie, collectively know as New West Guitar Group-have been together for a dozen years with six previous albums and one concert DVD to their credit. By now they’re masters of their caressing, cascading sound, best categorized as chamber jazz. Their overarching mellowness (dexterously peppered, now and again, with Gypsy fire, flamenco zest and steel-string twang) suits their quintet of world-class guests-Tierney Sutton, Becca Stevens, Gretchen Parlato, Sara Gazarek and a lone male, New York Voices’ Peter Eldridge-just fine, providing deftly constructed beds for their vocals. Parlato opens with a breathy “Send One Your Love,” later returning for a tremulous “Like Someone in Love.” Stevens shapes a gorgeously befogged “Detour Ahead” and, against near-baroque backing, a gently swirling interpretation of Elliott Smith’s “Waltz No. 1.” Gazarek delivers a stunningly spare “I Fall in Love Too Easily” and a sweet, loping “Secret o’ Life.” Sutton livens the pace with a deliciously fervid “You’d Be So Nice to Come Home To,” then settles into the ruminative folds of Randy Newman’s “When She Loved Me.” Eldridge, always such a privilege to hear solo, travels from a magnificently jagged, storm-clouded “Black Crow” to a dreamily becalmed “My Ship.” Yes, the math is simple, but the results are immensely greater than the sum of their parts. Benny Green: Live in Santa Cruz!